Mykonos is normally windy (17 kts average wind speed during July and August), with a dominant north direction all year long. This doesn’t mean that you won’t be able to go to the beach, but a good advice is to check the weather in the morning to choose where to go wisely. Having predominant north wind is the reason why there are more beaches on the south, and tell us that the best time to go north is when it is not windy. Additionally, all northern beaches have little or no facilities at all. Agios Sostis was our favourite beach. It is quiet, relaxed, unspoiled and beautiful. This is due to its location, which is only accessible by car or motorbike (no buses), and a bit far from the popular southern beaches. So if you like this kind of natural beaches, with no chairs nor umbrellas nor music, Agios Sostis is the one. The main area stretches for about 250 meters. It is also located in a protected cove, so it is less windy than other northern beaches and the water is always clean. As there are no facilities, you will need to bring water/food and an umbrella. The latter should be placed carefully as there is always a breeze. And most of the times there is a guy selling cold water and beer. It is easy to get there, you can just follow a map or the signs. You will pass Panormos beach on the way. You can park the car/bike on a small road and walk downhill. You will first see a taverna next to a small beach area (second picture above), then a tiny church (which gives the name to the beach) and then a path to the main beach area (first picture above). The taverna is Kikis Tavern, the most popular taverna in the island. Its popularity comes from its delicious food, excellent location, friendly staff, and for having no electricity. But with great popularity comes great difficulty to get a table. So be prepared for an hour (average) wait. It could be 30 minutes but also an hour and a half. Mr Vassilis is the man who remembers the guests to be seated and offers rose and water while waiting. However; your patience will be rewarded. Grilled seafood and meat accompanied by rustic-chic salads, and even sweet treats for dessert such as chocolate brownie. Greek, lentil or artichokes with parmesan salads, grilled calamari, octopus, sea bass, lamb or pork chops, and more. Kalo Livadi was also our favourite, but there are a few things to consider. 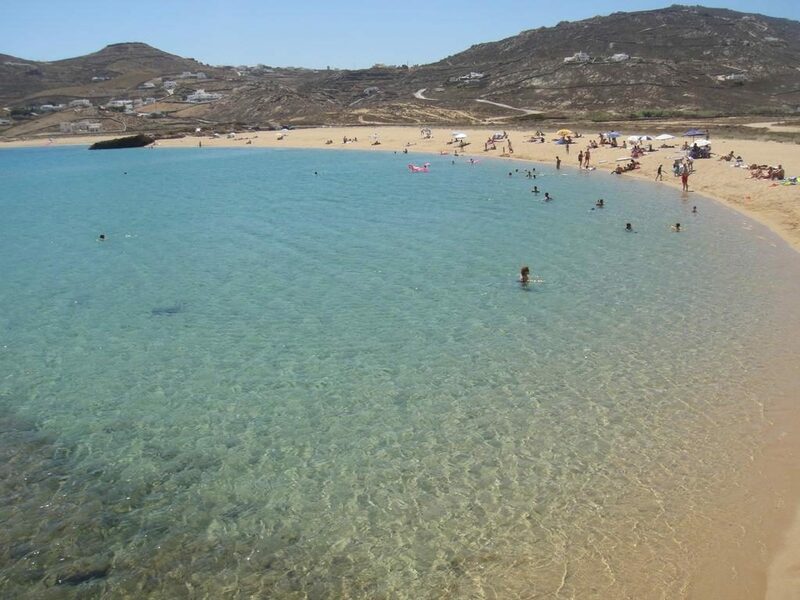 It is a long sandy beach located between Kalafatis and Elia beach, 10 km from Mykonos Town and 2 km from Ano Mera. Buses stop at the top of the road and there is a short walk to the beach (note that the climb back up is steep). The sand is thinner than in other beaches but there are some stony areas as well. The water is calm, clean and shallow, with areas where you can swim for 50 metres and then stand. The public (umbrella/sunbed free) area is on the right end (see pictures above) and the hill behind offer a fresh shade during the late afternoon. 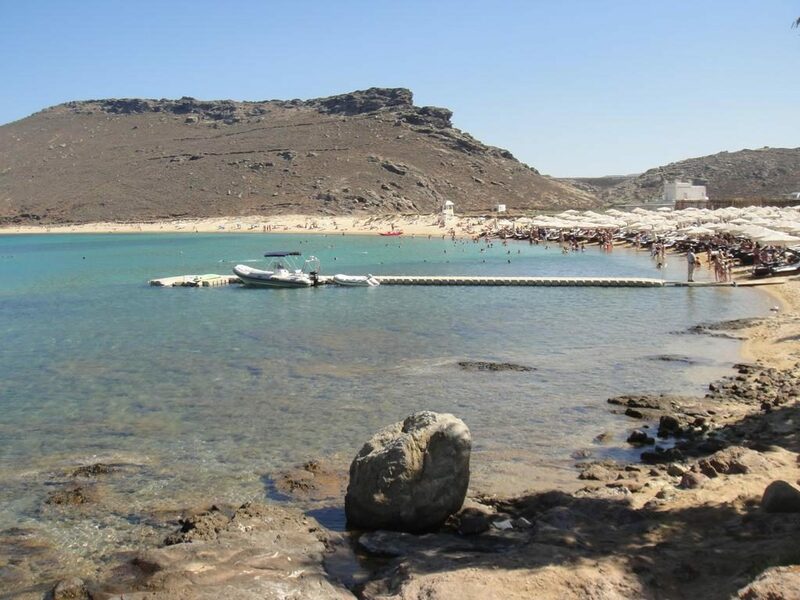 An important consideration is that there is an investment programme in progress (Lohan Beach Club, named after the Disney actress, who later became controversial and who we ran by at the airport) which is slowly turning the beach into a private place. Expensive umbrellas, sunbeds and sundecks (15-25€ per/day) are taking every square inch of beach. Nonetheless, we enjoyed our stay there and we hope they will leave a free area. 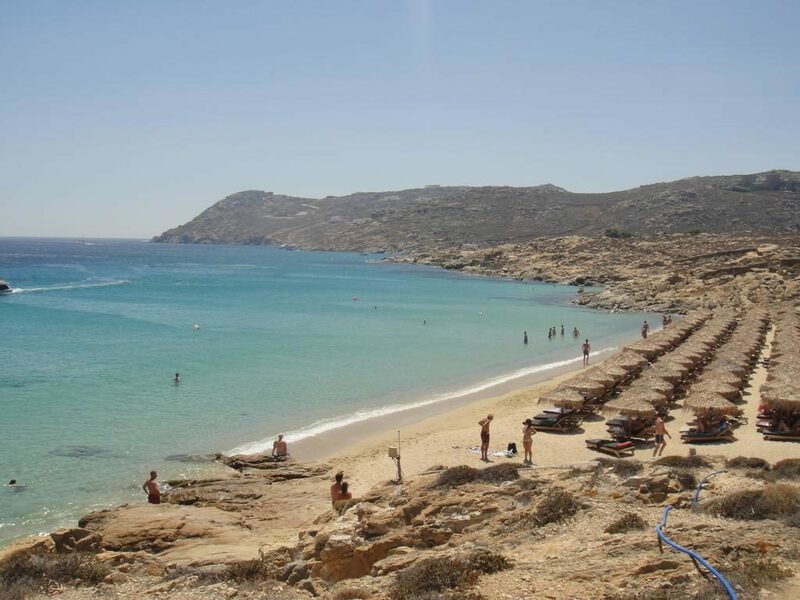 Panormos is located on the northern side of the island, just before Agios Sostis, and secluded enough to not get overcrowded. Visitors need private transport as no buses get there. It offers blue and clean waters, golden sand (not too thin though) and it is surrounded by brown hills. There is a clear separation between the public area and the beach club called Principote, and the same separation remains for the big parking at the entrance. So when it comes to facilities you have the option: your own umbrella and towel or the luxurious and expensive Principote, which is primarily addressed at visitors with financial comfort, with sunbeds up to 60€. One downside is that the music can get too loud at around 3 pm. 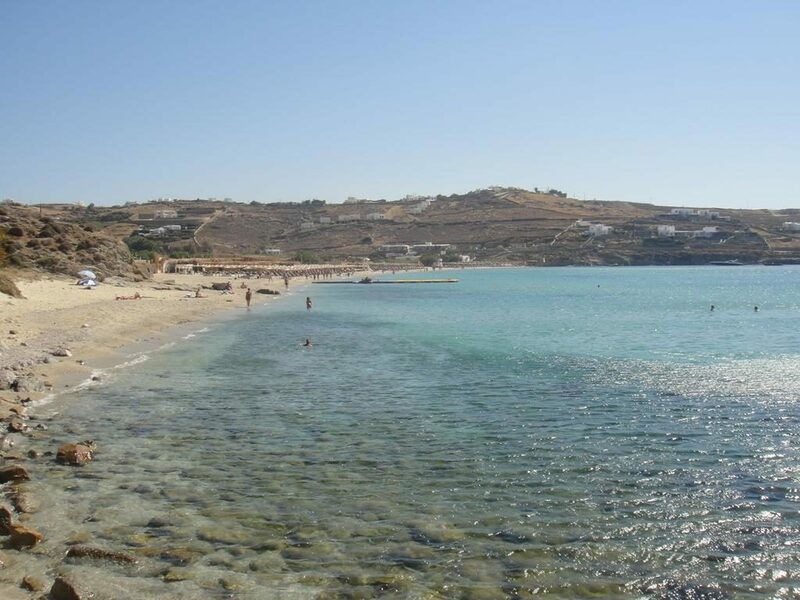 Ftelia is a large, peaceful and uncrowded beach on the north side of the island. Huge public space with no music nor sunbeds. There are three different areas separated by rocks. You can see the main one on the first picture above, and the other two in the second image. It also particularly famous among the windsurfers due to the Meltemi (Cycladic wind). Ftelia is the main restaurant and beach club. It is located on the left end and occupies only a very small portion of the beach. They offer a good variety of food, being pizza one of the specialities. It is a bit pricey but the view is beautiful, and it is a great spot for sunsets. On the other end of the beach, there is another restaurant called Alemagou Beach bar. It is 20 minutes walk from Ftelia, but you need to take the road to reach it, so going by car may be a better idea (5 minutes). They offer delicious seafood and a great service. Great spot for sunset as well, with good music and atmosphere. 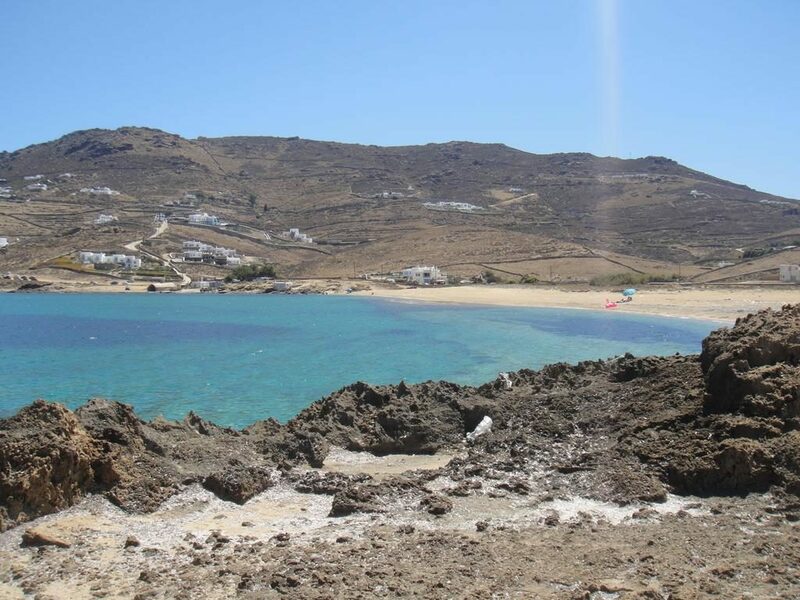 Elia is the longest sandy beach of Mykonos, and one of the most popular as it is considered in the top 5 beaches in Greece. It is fully organized, offering a wide choice of taverns, bars, water sports (water-skiing, parasailing and windsurfing), sunbeds and umbrellas (~€30). It is situated in the south of the island, and it can be reached by bus or boat (is the last stop on the caique, a traditional fishing boat used as a taxi). It is surrounded by brown hills, but also some traditional Cycladean houses, a few major expensive hotels and also some private villas for rent, resulting in a tiny town. With golden sand and clear blue waters, there is no doubt is a wonderful beach. However; it is now clearly taken by the beach clubs. As you can see in the pictures above, there is practically no public/clear space where we can lie down and use your own colourful and low-quality umbrella. This is an important downside if you like uncrowded and natural beaches. At the right end of the beach, you can find the gay area (second picture above) followed by the nudist area. Fokos is located on the northern side of the island. Due to its long distance from the town and the southern beaches, Fokos remains calm and untouched, even in high season. Some maps do not even mark it. So this is another natural and public beach with no facilities, only accessible by private transport. It is located near Ano Mera, and right after the artificial lake of Marathi, the fresh water provider of the island. Behind Fokos Beach you can find another small and natural beach called Mysini. Both of them are as good as unknown to most of the tourists on Mykonos. The only downside is that it can get very windy, so better to pay attention to the weather and bring a jumper. Next to the beach, there is a small blue and white church (like many other around Greece) and an excellent taverna. 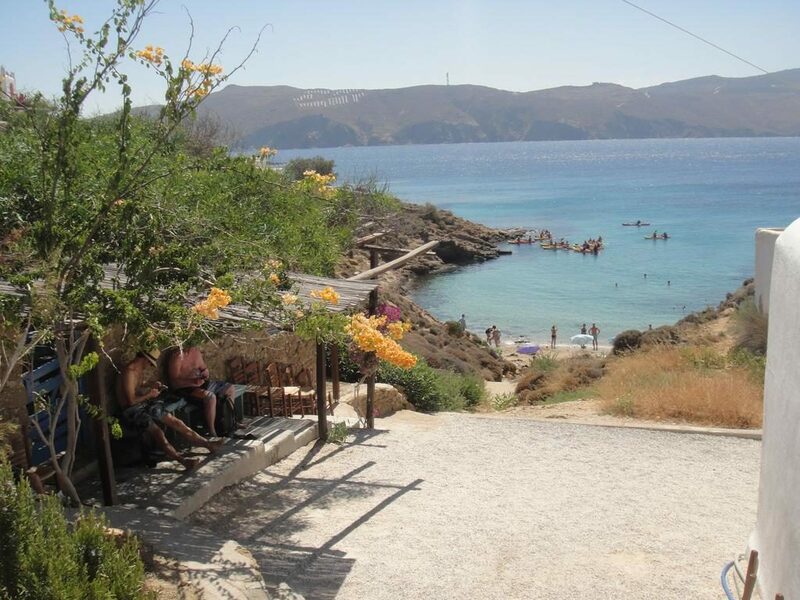 It is called Fokos Taverna and it is considered one of the best in the island. It has great views and provides good shelter from the sun and wind. Very friendly staff, generous portions and modest prices, that’s it. Mixed meze, grilled fish and seafood, salads, lamb chops are some of their options. Kalafatis is on the southern part of the island and is well known for its water sports. On the left corner, there are standard beach facilities plus a windsurf centre (boards for rent) and a watersports centre (jet skies for rent). The right corner of the beach (first picture above) is more relaxed and calm, keeping a considerable distance from the watersports. There is a long stretch of sand with plenty of space for public use. There is a road bordering the beach from one end to the other, separated by a good amount of trees which offer shade for free during the late afternoon. At the end of the road, you can find a little and authentic Greek village and a taverna. There are also areas with sea plants and fish, which makes it a good spot for snorkelers. 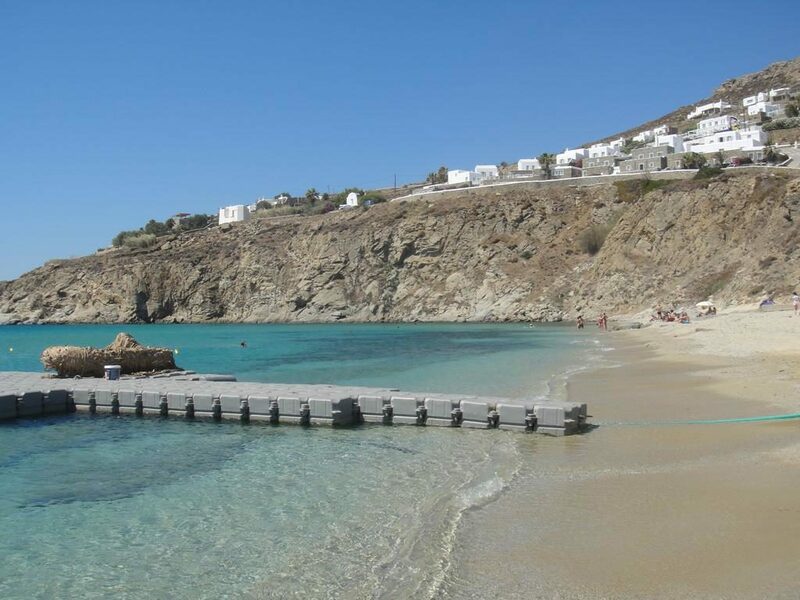 Overall the beach has quite a different vibe from the other in Mykonos, and we enjoyed it a lot. Kalafatis has a connection by bus to Mykonos Town a couple of times a day. If you take it, bear in mind that the last bus returning is around 6 pm. We stayed at Chill Out Studios and I can say it was a great choice. It’s one of those places that can change your stay for good. Extremely nice and helpful hosts (Mike and Ada), fabulous location, airport/port transfer included, swimming pool and stunning sunset. It is only 400 m away from the Old Town and Little Venice, although the street is steep. Another important recommendation is Veneti Bakery. It is on the main road and you can visit it on your way to the beach. You can buy to take away but they have also tables. You would expect a simple bakery, but it is not. Delicious sweet and savoury pastries, super friendly and helpful staff, a good variety of sandwiches, juices, smoothies, and coffee (including Freddos). There is also less fancy and cosier alternative called Artisti. You should try them on your first day as you may come back for the rest of your trip. Our favourite grilled fish (squid) was by far the one we had in Sardelles, a small restaurant outside of the town, metres away from Chill Out Studios. Last but not least, Sakis Grill House serves the best souvlaki and other Greek street food in town.